Mary Lynn Johnson, special assistant (emerita), President’s Office, University of Iowa, has taught at the University of Illinois at Urbana-Champaign and Georgia State University. 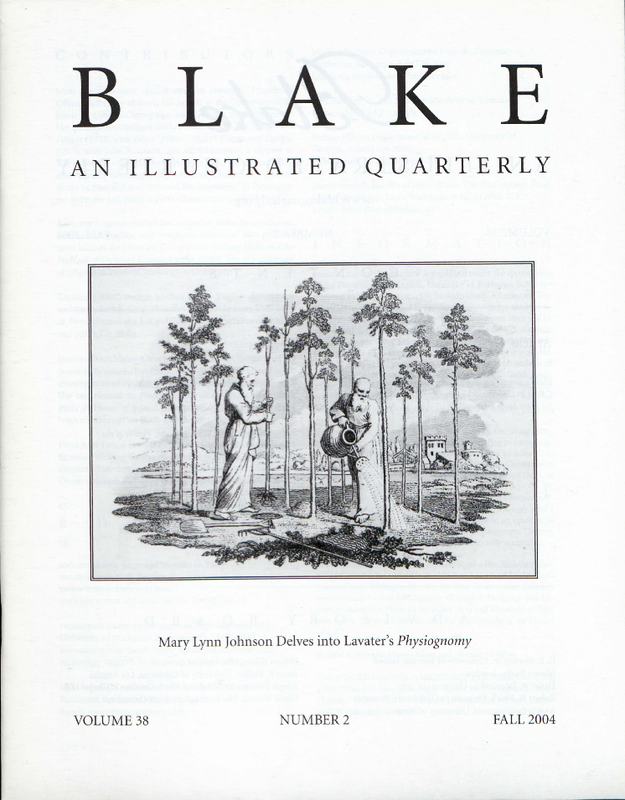 Her publications include Blake’s ‘Four Zoas’: The Design of a Dream (1978; with Brian Wilkie), Blake’s Poetry and Designs (1979, with John E. Grant; 2nd ed. underway), a chapter in The Cambridge Companion to William Blake (ed. Eaves, 2003), and “Lavater Contemplating a Bust of Chatham: A Conundrum in National and Personal Physiognomy,” in Physiognomy in Profile (ed. Melissa Percival, expected in 2005). Kathleen Lundeen teaches and writes on Blake, Romanticism, intermedial studies, and prophetic literature. Her publications include Knight of the Living Dead: William Blake and the Problem of Ontology (Susquehanna, 2000). She is a professor of English at Western Washington University. Catherine McClenahan teaches in the English department and the Robert E. Cook Honors College at Indiana University of Pennsylvania; she has published several articles on gender and politics in Blake. Jennifer Davis Michael teaches English at the University of the South in Sewanee, Tennessee, and writes on Blake and other convergences of visual and verbal art in the Romantic period. She contributed to Prophetic Character: Essays on William Blake in Honor of John E. Grant, and is currently revising a book manuscript on Blake and the city. Dena Bain Taylor is senior lecturer and director of the Health Sciences Writing Centre at the University of Toronto. Her doctoral dissertation (Toronto, 1983) was Emanations of the Divine: William Blake and the Kabbalah. Cover: “AGED FIGURES, GARDENING,” engr. Blake; fasc. V, July 1788; “Two old Men gardening,” Essays on Physiognomy, trans. Hunter, I (1789) 127; 6.1 × 8.4 cm. ; image 5.2 × 7.2 cm. Collection of Mary Lynn Johnson.